FamilyMeans envisions vibrant and resilient communities where everyone lives to their fullest potential. A family consists of people, whether living together or apart, related by blood, marriage, adoption, or the commitment to care for or about one another. 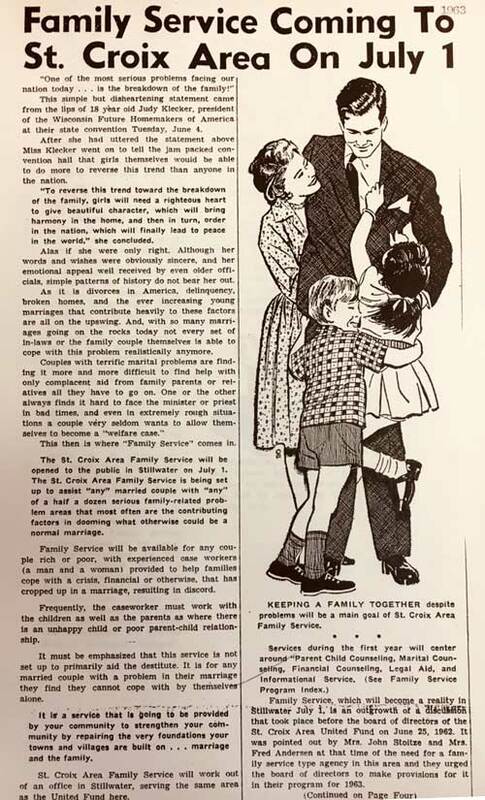 In June of 1962 a committee was established by the St. Croix Area United Way with the intent to survey Stillwater and the surrounding area for a need for family services. It was found that there was a strong need for counseling services in three main areas; marital problems, child guidance, and financial planning. 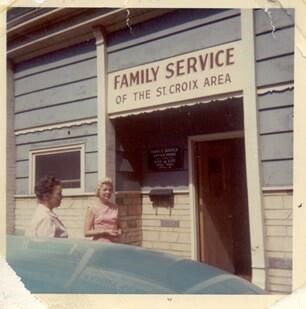 On July 1st, 1963, Family Service of St. Croix Area is established. Dawson Bradshaw is named first executive director. The first year, 125 families requested services. From then on the need for services continues to grow. Twelve years after opening its doors, Family Service of St. Croix Area is serving over 300 families and outgrowing the budget and funding provided by the St. Croix Area United Way. Individuals and families continued to seek support for marital disharmony, child development, and financial guidance. A year later, James Dinzeo became the second executive director. The agency became independent of Family Service of St. Paul. Sandra Schearer was appointed the third executive director. Respite care programming is added to the agency’s outreach. The growth of Family Service of St. Croix Area leads to the opening of offices in Woodbury, Minnesota and Hudson, Wisconsin. These offices open in an effort to make services more accessible. Youth Programs begins work in the village of Landfall. The Grace Stoltze Award is established for meritorious volunteer contributions to FamilyMeans. In addition, our name was changed from Family Service of St. Croix Area to Family Service St. Croix. Arba-Della Beck is hired as the agency’s fourth leader and named president. In an effort to become more relatable and differentiated, Family Service St. Croix changed names again to FamilyMeans. Awareness continued to grow. We were now providing mental health counselors in a number of Stillwater area schools. Imagine…The Campaign for FamilyMeans is successful and results in the new construction of a headquarters in Stillwater. A second Youth Program initiative begins at Cimarron, Lake Elmo, followed by a youth center built in 2015. The Consumer Credit Counseling Services (now Financial Solutions) institutes its Debt Management Program. The Center for Grief, Loss, and Transition in St. Paul, Minnesota merges with FamilyMeans. This site on Grand Avenue provides specialized counseling in the areas of complicated grief, loss, and trauma. FamilyMeans celebrates a half-century and is named by the StarTribune as one of the metro’s best employers. June 2018 marks the agency’s 55th year of operation. We continue to strive to support the community by providing support services that help to face life’s challenges.